During the month of April, our engineering team continued improving Collage by working on many facets of the platform, visible and hidden, releasing new features along the way. We released a new feature to help you communicate any news/updates you have for your entire team. 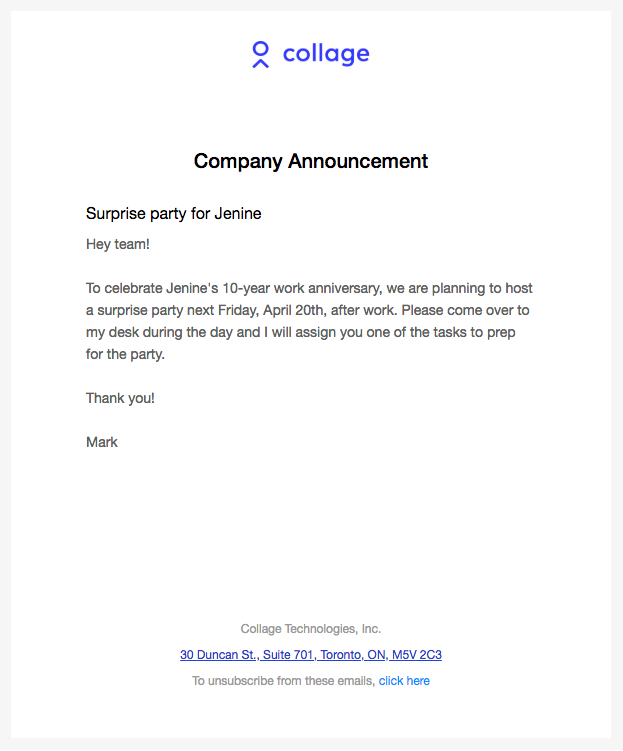 Found under your company settings, you can use Announcements to send a company-wide email notifying your team of anything exciting, important, or surprising. This month our engineering team has also done a lot of work behind the scenes. One of the noticeable benefits of which is our new tables across the platform, such as the tables for employee directory and benefits enrolments. They are faster, simpler, and smarter! For example, when you open an employee's profile from the employee directory and then click back, the system now remembers what page you were on and brings you right back where you were. If you a type of person who opens dozens of browser tabs at a time (don't worry, we are the same! 🙂), we now name Collage tabs to help you navigate between them quicker. We've finally fixed a disrespectful bug where terminated employees' names would not show up in the task list under the Company Inbox. Our apologies to the departed employees!